Shopping for Star Wars Wall Murals? Awaken the Force in your room. Make your space scream Star Wars! Stunning wallpaper mural measures 10 1/2-feet wide x 6-feet tall! Kylo Ren, BB-8, R2-D2, the Millennium Falcon, TIE fighters, and more. 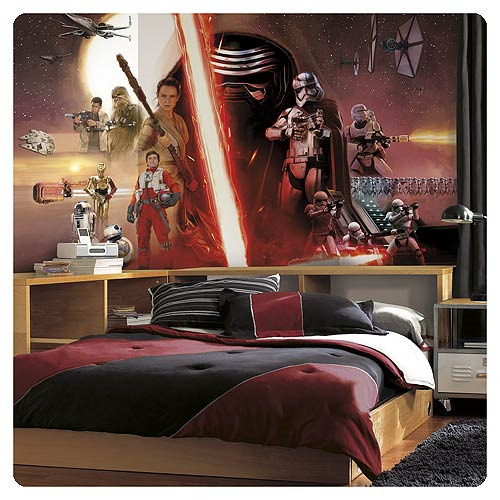 Bring Star Wars: The Force Awakens to your bedroom with this 10 1/2-foot wide x 6-foot tall wallpaper mural presenting a stunning image of Kylo Ren, BB-8, R2-D2, C-3PO, the Millennium Falcon, TIE fighters, X-Wings, Captain Phasma, Rey, Poe Dameron, Finn, First Order Stormtroopers, and a Flametrooper. It will make your space scream Star Wars! Ages 3 and up.